We have an incredible team ready to help your child grow. Bay Area SpeechWorks was founded in 1998 by Leslie Whitaker. ​It is comprised of dedicated Speech Pathologists (SLP) and Speech Language Pathology Assistants (SLP-A) who have a passion for helping children grow. 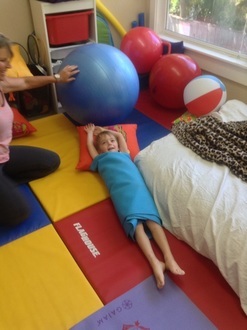 In 2003, Leslie met Corry Wagner in a yoga class and had a vision of treating children holistically with a combination of speech and occupational therapy. In 2011, vision became reality and Corry joined the team. Leslie is the owner and founder of Bay Area SpeechWorks (BASW). She has been nationally certified and licensed in California since 2001. She holds a Certificate of Clinical Competence (CCC) from the American Speech Hearing Association (ASHA). 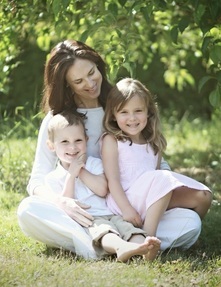 Leslie is originally from North Palm Beach, Florida, but now resides in Mill Valley with her 2 young children. She graduated from Florida State University with a BA in English Literature and Appalachian State University in North Carolina with an MA in Communication Disorders/emphasis on Reading Disorders. Leslie is passionate about helping her clients grow and find success in achieving their goals. Corry leads the Occupational Therapy program at our clinic. In addition to working in traditional occupational therapy areas of fine and gross motor skills, Corry specializes in supporting children with self-regulation, anxiety and/or depression. She utilizes yoga & meditation and provides support for the entire family. Corry is originally from San Diego and lives in Mill Valley with her young son. She received her masters in Occupational Therapy from Samuel Merritt in 2007. Corry believes that every child has their own gifts, and by using her expertise and meeting them where they are, those gifts can be unlocked to allow them to thrive and find their unique way in the world. In addition to working with children, she also leads parent education seminars aimed at providing parents with the tools to support their child's development at home. ​her bachelor's degree in Developmental Psychology from St. Mary's College of California. After a short stint as a special education teacher, she earned her master's degree in Speech Language Pathology from Loyola University in Baltimore, MD. She has also received a Certification of Clinical Competence (CCC) from the American Speech-Language Hearing Association, and is licensed by the California Speech-Language Hearing Association. Laura Osumi is a speech-language pathologist specializing in pediatric communication disorders. She has worked in many settings with a variety of ages and disorders including articulation, receptive and expressive language, social skills, processing and oral motor skills. She received a masters in Communication Disorders from Louisiana State University Medical Center, School of Allied Health in New Orleans, Louisiana. Jess is a Speech and Language Therapist Assistant who has over 10 years of clinical experience in working with children with a variety of developmental delays specializing in children with Autism. She is a graduate of University of Connecticut with a Bachelors degree in Human Development and Family relations. She completed training in Communication disorders at California State, Long Beach. Jess specializes in work with preschool, school-age children, and teenagers in partnership with families and or other primary support systems. She has worked in many settings including homes, clinics, early intervention programs and schools. Jess has extensive experience in the areas of Applied-Behavior Analysis (ABA-DT) and has worked closely with families to create individualized behavior plans to help their children communicate, play and learn. Jess is trained in many of Lindamood Bell’s programs such as Talkies, Visualizing and Verbalizing, and Lips. Jess has a particular passion for teaching children social skills and incorporates the Superflex curriculum. She has attended several of Michelle Garcia Winner’s trainings on social thinking including the most recent Social Thinking Provider’s Conference (June 2014). In addition, she has developed programs to help children with potty training, feeding, social outings, fostering friendships, and social and emotional intelligence. Since 2001, Jess has been devoted to helping children and families navigate their way through communication and developmental delays. She offers practical, effective and compassionate speech and language therapy tailored to each child and family.